MORE than a billion in government funding has been pledged to build four new submarines for the Royal Navy. Michael Fallon MP, Secretary of State for Defence, announced today that nearly £1.3 billion in funding has been pledged for the new submarines to replace the current Vanguard class as part of the Successor programme. The first submarine will enter service in the early 2030s. The Ministry of Defence (MOD) will cover the initial manufacturing work, which starts next week. 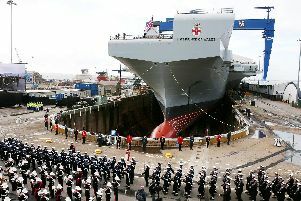 Construction of the submarines will take place at Portsmouth-based BAE Systems’ site in Barrow-in-Furness, Cumbria. Mr Fallon said: ‘Britain’s ballistic missile submarines are the ultimate guarantee of our nation’s safety - we use them everyday to deter the most extreme threats.